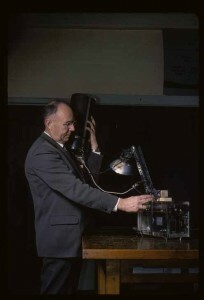 Doc Edgerton with underwater camera equipment, in 1967. Doc was an elder statesman of MIT by the time I was there — he helped me by always being willing to speak at events I was organizing. As I recall, it was out of the blue that he said, “You should read Ben Franklin’s autobiography; I did when I was your age, and it was important,” or something like that. It took me a year or so to find it in a used book store (this was before the Internet) and I read it and it has absolutely changed the course of my life. What a gift. This entry was posted on Friday, April 29th, 2011 at 9:06 pm and is filed under Personal stories. You can follow any responses to this entry through the RSS 2.0 feed. Both comments and pings are currently closed.